WHAT A GOOD SONGS. OLD IS GOLD IS CORRECT. I LIKE ALL THE SONGS. Susheela is blessed. Fans of Susheela are blessed a lot. With her in-depth knowledge in music, she sings with ease, immersed in the meaning of songs. Sweet voice, she sings sincerely. Living legend. I really like Legend P.Suheela of all times singer for nearly 6 decades ! I really love all her songs ! Her songs are really melodious & mind blowing ! Excellent voice ! I really love her melodious singing ! While hearing P.Susheela voice my heart, mind & soul is relaxed & peaceful ! horrible… same with Sonnathu needhana,…. Hany voice, P.Susila mam.very nice& Hart touch Songs. Gar s Gift susila mam. 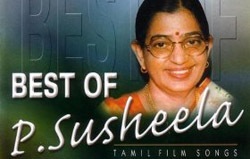 i cannot forget the suseela songs. Oh my dear my role model susilama I lv u…….. I love always suseela amma songs only.